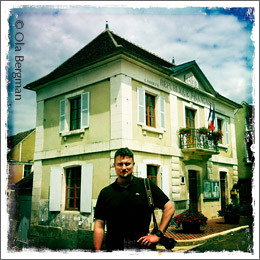 Bergman's Bourgogne: Who to blame! lcohol can seriously damage your health. We all know that. What they don't tell you is that a single bottle of wine may seriously change your life; where you spend your holidays, what you read, what you eat and drink, where your thoughts tend to wander off while daydreaming. It may even make you devote a whole web site to a single subject. In my case it was a bottle of Chambolle-Musigny, Les Charmes, by Domaine Ghislaine Barthod. My wife and I shared it over dinner at a London restaurant some fifteen years ago. I was hooked. Some years later my wife had rented a row of vines at Domaine Lucien Jacob in Échevronne as a birthday gift for me. Not only was it a great gift, it also "forced" us to visit Burgundy in person to pick up the wine. What I discovered was that Burgundy not only produces lovely wines, but also offers great food, a wonderful atmosphere and welcoming people. I felt at home right away. Today our wine cellar is a mini Burgundy. Two thirds of the bottles come from the Cote d'Or, the Cote Chalonnaise, the Mâconnais and Chablis. This is my way of saying thank you to all the generous people in Burgundy who have shared their time and thoughts with us along the years. To you I raise my glass.